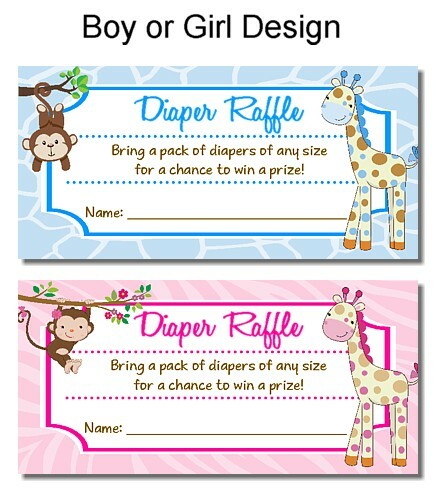 A diaper raffle is a great way to ensure the mom-to-be get lots of diapers at her baby shower. Let the guests know that there will be a prize for every package of diapers they bring either on the invitation or enclose one of these tickets in with the invitation. When a guest bring diapers have them fill out one of these adorable raffle tickets for each package of diapers they brought for a chance to win a prize. Includes one sheet of 10 diaper raffle tickets measuring approximately 3 3/4" x 2 ". Sold by sets of 10's. So for example, if you need a total of 60 raffle tickets, you'll need to order 6 sets. These come 10 tickets to a sheet and are uncut so you will need to cut them out along the borders using scissors or a paper trimmer/cutter, very easy to do. Please check out my store for matching invitations, etc.